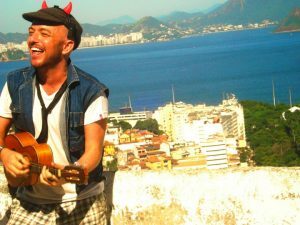 RIO DE JANEIRO, BRAZIL – Achieving initial success with an English language version of a popular Rio football (soccer) team anthem and with traditional samba marchas covered in English for foreigners, Brazilian musician Le Andrade will soon debut his first EP of original material. Brazilian musician Le Andrade to release his first EP of original music, photo courtesy of Le Andrade. At the same time, Andrade was also developing a love for languages, both Portuguese & English. His second love lead him he to earn his degree in literature with an emphasis on translation. Andrade eventually made his way to Rio where he lived and absorbed the music scene for thirteen years. Andrade took that feeling in and made it his own by translating traditional samba songs into English versions. 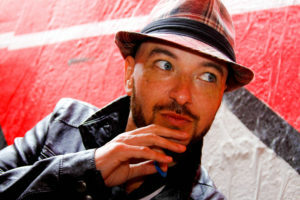 He had first received international attention after releasing his English language cover of the Flamengo – a Rio de Janeiro football (soccer) team – anthem. The online videos for the song have over 500,000 combined views to date. “I always loved percussion and ‘groovy’ rhythms, even all the way back to my first guitar strummings,” says Andrade, photo courtesy of Le Andrade. Andrade perfected his live act by playing with numerous musicians and bands, including Jorge Ben Jor while simultaneously writing and performing original music. During a trip to New York for a show that turned into a five month stay in 2011, Andrade meet TV Presenter Edgard Picolli and played for him in his home. “The result was so good, the band played so tight and well that I decided to use three of the songs we did and put them on a CD,” says Andrade. The song that Andrade recorded with Solomon is one of his original Portuguese songs entitled “Não Tem Pra Ninguém” and it was also included with songs by Brazilian artists Gilberto Gil and Elza Soares in the award winning soundtrack of the Brazilian film “Elvis e Madonna.” Its video will be released for the upcoming EP, scheduled for distribution in mid-June. The EP will also feature one track in English entitled, “Gonna Get You” and is scheduled to be released in mid-June. The first show in support of the CD will take place in Campinas. Le Andrade puts alot of heart and soul into his music the Brasilian way he does it from his influences of English and Portuguese he’s a natural talent I wish him the best!